It’s Thursday, which means it’s almost the weekend. Whew! 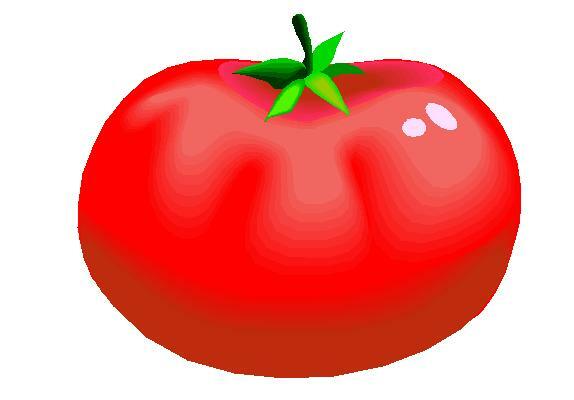 Last night I meant to write up a What is it Wednesday post after dinner, but I completely forgot! The Homemade Household has been busy with planting the garden, finishing the kitchen floor and planning for our upcoming trip. Benzo and I are both out of town on business next week and when we get back it will be less than one month until we leave for Hawaii. So we want to get our last few reservations and preparations made before we leave next week. I already mentioned that I’ve turned into a shop-a-holic over this trip. Since we are doing an overnight hike we’ve been looking at lots and lots of gear online and have been to Cabelas about 18 times. I will be glad when decisions are made and everything is settled. Planning for a vacation can be stressful! Anywho I’ve been meaning to put this post up all week. This is the second dish that I took to my family gathering last Sunday. The first dish was the fabulous fruit tart. 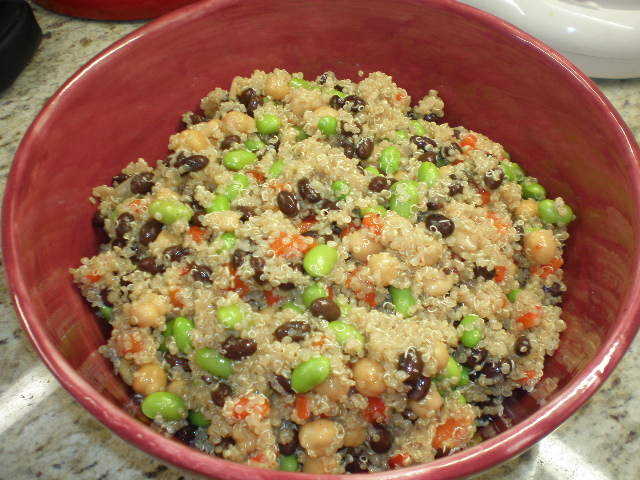 I wanted to take something else that would complement the main course so I made Three Bean Quinoa Salad. This dish is so easy and it’s perfect for pot luck gatherings because it makes a lot and can be served at room temperature. It’s also highly adaptable to whatever you have on hand in your pantry. The original recipe is from Whole Foods. I found it in a flyer I picked up at the store last summer. I’ve only made a few minor modifications. Below is how I made it this time, but I’ve made lots of variations on this baby. In a medium saucepan, bring water to a boil. Add quinoa and give it a quick stir. Cover and reduce heat. Simmer for 15-20 minutes until quinoa is cooked and liquid is absorbed. Meanwhile mix all beans and red pepper in a bowl. When quinoa is done, add to the bean mixture. Add dressing and stir to coat. Add salt and pepper to taste (and any other spices you want!). It makes a giant bowlful. Perfect for a large gathering. This recipe is great because you can use any beans you like. I’ve used green beans, black eyed peas, kidney beans, and white beans before. You can also use any dressing you have on hand, or make your own. I almost always use balsalmic because that’s what I always have on hand. I roasted my own red pepper for this recipe, but you can used jarred ones too. It’s really easy to roast red peppers in your own oven. I will put up a separate post on how to do that. Benzo took lots of great pictures of the process. You could throw in some other veggies too if you want. 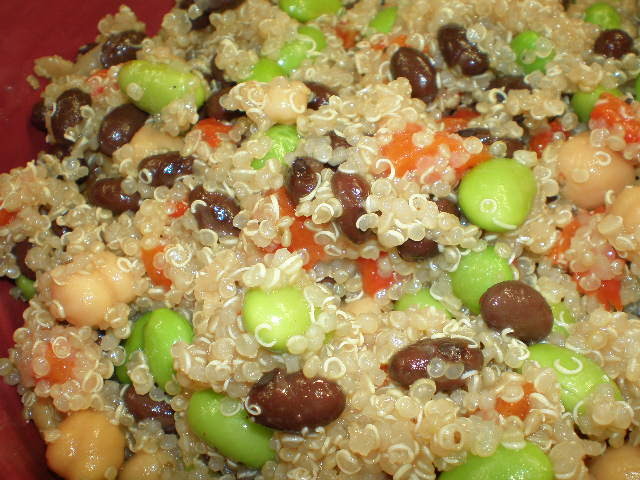 Quinoa and beans are packed with protein and fiber so this dish is very filling. Sometimes I’ll make it on Sunday night and eat it for lunch all week. It goes well in a pita or you could even put it in a wrap with some lettuce. Or you could make lettuce wraps! Genius. I love this stuff and can eat it by the bucketful. But….I don’t think my family liked it very much! 😦 Not very many of them knew what quinoa was. My cousin’s wife did say she liked it and she fed some to her kid who also seemed to like it. But my step-mom said it tasted “healthy” and “needed more flavor”. And I think some of my family members were too scared to try it! Boooo! Previous Post My Seedlings Are Falling! I don’t even like most beans and I think this looks delicious! Look at all the wonderful colors in this dish! Your brother said this dish was very good. I think it might make too much for me.